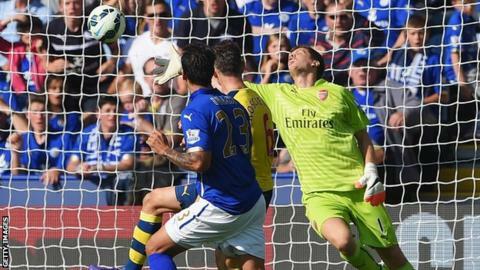 Leonardo Ulloa's second goal in successive home games gave Leicester a deserved point against Arsenal. Alexis Sanchez turned in his first Arsenal league goal from close range after Yaya Sanogo had bundled the ball past keeper Kasper Schmeichel. But Nigel Pearson's promoted side were soon level as Argentine Ulloa climbed above Laurent Koscielny to head in. Leicester had the clearer second-half chances, with Ulloa and substitute Jamie Vardy going close. Ulloa created a great chance for himself early in the second period after playing a one-two with Riyad Mahrez and leaving defender Calum Chambers on the floor with a brilliant turn, but he fired high into the side netting. In the closing stages, Vardy led a swift counter-attack and burst into the penalty area after exchanging passes with David Nugent, but his shot was pushed aside by Arsenal keeper Wojciech Szczesny. While Leicester showed they were worthy of a point, it was a difficult afternoon for Arsenal, for whom centre-back Laurent Koscielny had to come off in the first half with a head injury. Midfielder Mesut Ozil sustained an ankle problem and Alex Oxlade-Chamberlain a calf injury late on, but manager Arsene Wenger suggested that neither were serious. In the case of winger Oxlade-Chamberlain, that will come as a relief to England manager Roy Hodgson ahead of a friendly against Norway on Wednesday and a Euro 2016 qualifier in Switzerland the following Monday. On the evidence of events at the King Power Stadium, Arsenal manager Arsene Wenger is no closer to solving the problem of who to play at centre-forward after Olivier Giroud was ruled out until the new year with a broken leg. Sanogo was given only his second Premier League start as Sanchez was moved to a wide role, but the French forward turned in an untidy performance despite his role in Arsenal's goal. His best chance to score came just before the hour mark as full-back Nacho Monreal burst forward to set him up, but Schmeichel timed well an advance from his line to block. Leicester were full of energy, and although they had to spend a lot of the game defending against Arsenal's swift passing, they were quick to break when they got the chance. The visitors were troubled by Leicester's physical presence, and Koscielny needed more than three minutes of treatment after an early accidental collision with Jeff Schlupp. But Arsenal took the lead in the 20th minute when Sanogo raced on to Santi Cazorla's well-judged chip, and bundled the ball past Schmeichel for Sanchez to turn in. Leicester have scored at least once in each of their last 17 league games at home, a run stretching back to last November. Koscielny, having returned to the action sporting a blue bandage to cover his head wound, had to take a large share of the blame for Leicester's quick equaliser. The French defender failed to track Ulloa, who was left free to climb and power in a header from the dangerous Schlupp's left-wing cross - following up the goal he scored in the 2-2 draw with Everton on 16 August. Wenger responded by replacing Koscielny with Chambers, and the 19-year-old - who won his first senior England call-up during the week - was stretched to his limits by Leicester's lively attack. The Gunners continued to create chances as the match opened up, and Aaron Ramsey should have done better than loop a tame header at Schmeichel from Cazorla's chip. But it was the home side who looked stronger in the closing stages as injuries began to catch up with Arsenal, with Ozil going down holding his ankle after the visitors had made all three of their substitutions. Vardy was denied by Szczesny, before the striker's fellow Foxes substitute Danny Drinkwater hit a 20-yard shot just wide of the goalkeeper's left-hand post. "It was another illustration of how difficult the Premier League can be. We played well, but we have played better and been more assured in possession. But we still showed the ability to create things. "To be successful you can't go into the Premier League and just be tight and not create things. We looked dangerous on the counter-attack and with some decent moves. We have got more to come. We are disappointed not to win." Match ends, Leicester City 1, Arsenal 1. Second Half ends, Leicester City 1, Arsenal 1. Attempt missed. Daniel Drinkwater (Leicester City) left footed shot from outside the box is close, but misses to the right. Assisted by Andy King. Wojciech Szczesny (Arsenal) is shown the yellow card. Liam Moore (Leicester City) is shown the yellow card. Wojciech Szczesny (Arsenal) wins a free kick in the defensive half. Corner, Leicester City. Conceded by Nacho Monreal. Dean Hammond (Leicester City) is shown the yellow card for a bad foul. Alex Oxlade-Chamberlain (Arsenal) wins a free kick on the right wing. Attempt saved. Jamie Vardy (Leicester City) right footed shot from the right side of the box is saved in the centre of the goal. Assisted by David Nugent. Attempt missed. Per Mertesacker (Arsenal) header from the centre of the box misses to the right. Assisted by Mesut Özil with a cross following a corner. Corner, Arsenal. Conceded by Ritchie de Laet. Substitution, Arsenal. Lukas Podolski replaces Yaya Sanogo. Substitution, Arsenal. Alex Oxlade-Chamberlain replaces Santiago Cazorla. Substitution, Leicester City. Daniel Drinkwater replaces Leonardo Ulloa because of an injury. Corner, Arsenal. Conceded by Liam Moore. Attempt blocked. Santiago Cazorla (Arsenal) left footed shot from outside the box is blocked. Assisted by Aaron Ramsey. Offside, Leicester City. Ritchie de Laet tries a through ball, but Leonardo Ulloa is caught offside. Attempt missed. Yaya Sanogo (Arsenal) header from the centre of the box is too high. Assisted by Santiago Cazorla with a cross. Corner, Arsenal. Conceded by Jeffrey Schlupp.